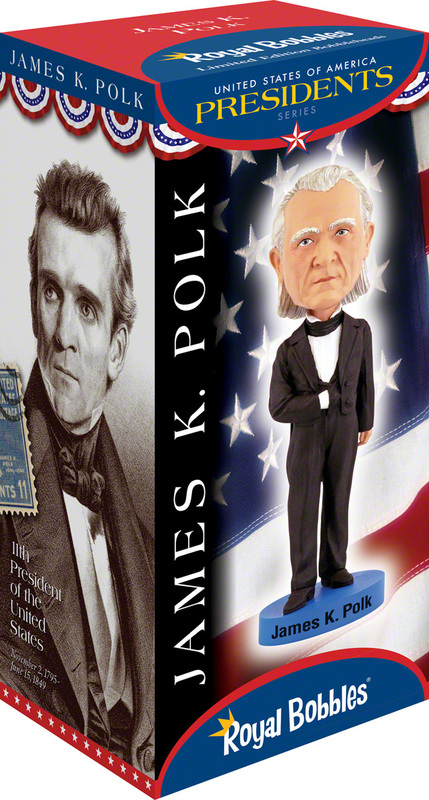 James K. Polk, the nation’s 11th President was born in Pineville, North Carolina on November 2, 1795. The oldest of ten children, he moved with his parents to the Tennessee frontier in 1806. A sickly boy, Polk had a hard time keeping up with his frontier mates. At age 17, he underwent major surgery that allowed him go to school for the first time. He graduated first in his class from the University of North Carolina at Chapel Hill in 1818. Returning to Tennessee, Polk studied law under famed attorney Felix Grundy and within five years was elected to his first of seven terms in the United States House of Representatives. He married Sarah Childress in 1824, and together, they became a powerful couple in Washington society. In his final two terms, Polk was elected Speaker of the House, and is to this day the only Speaker to be elected President of the United States. Polk gave up his seat in the house to run for governor of Tennessee and won. He lost two consecutive bids for reelection, yet at the lowest point in his career, and in one of the greatest political turn-arounds, was nominated for President on the Democratic ticket in 1844. Running against Whig candidate Henry Clay, Polk won the election by a few thousand votes, making him the first “Dark Horse” president in American history. Polk promised a single term and presented very specific and ambitious goals which included acquiring California from Mexico, settling the boundary of the United States in the Pacific Northwest, and creating an “Independent Treasury” system. By the end of his promised single term, Polk had managed to accomplish everything he set out to do. The youngest president up to the time, Polk retired to Nashville at the age of 53. Sadly, he died just three months later during a cholera epidemic.